Dresden’s Christmas Market is traditionally called Striezelmarkt, it is Germany’s oldest Christmas Market with a very long history dating back to 1434. Its name derives from Hefestriezel, a sweet delicacy which centuries later has become know as “Dresden Christstollen” (German Christmas Cake). 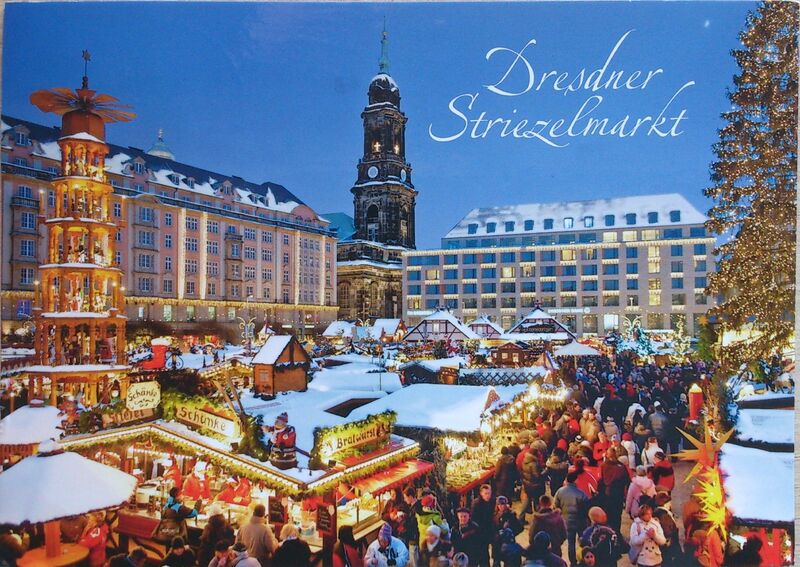 The Dresden Striezelmarkt is located on the Altmarkt Square, in the historical city centre. It is surrounded by various themed Christmas Markets, stretching up to the main railway station and the Albertplatz. The focal point of the Dresden Christmas Market is the world’s tallest Christmas pyramid, with a height of 14 metres and the world’s biggest nut cracker. The culinary attraction of the market, however, is the Dresden Christstollen, originally known as ‘Striezel’, which accounts for the market’s name. Event highlights of the Dresden Christmas Market are the Stollen Festival on the Saturday before the second Sunday in Advent and the Pyramid Festival on the Saturday before the third Sunday in Advent. 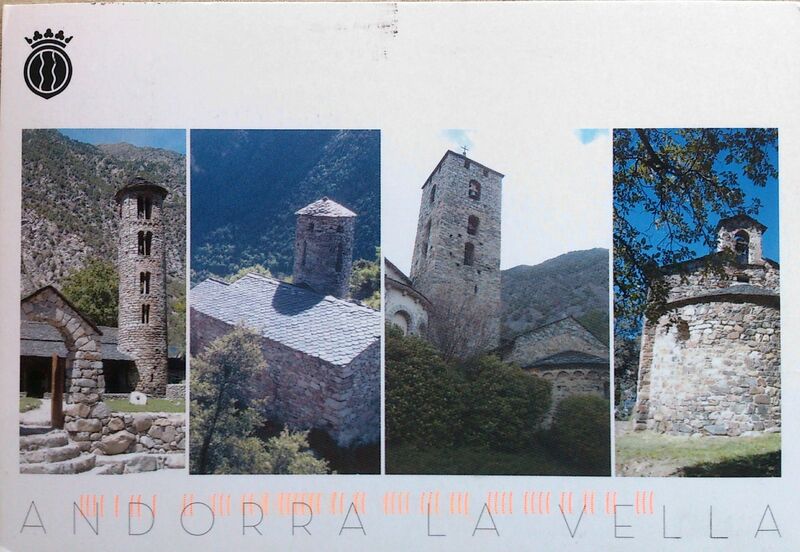 Andorra la Vella is the capital of the Principality of Andorra, and is located high in the east Pyrenees between France and Spain. It is also the name of the parish that surrounds the capital. As of 2011, the city has a population of 22,256, and the urban area, which includes Escaldes-Engordany plus satellite villages, has over 40,000 inhabitants. The principal industry is tourism, although the country also earns foreign income from being a tax haven. Furniture and brandies are local products. Being at an elevation of 1,023 metres (3,356 ft), it is the highest capital city in Europe and a popular ski resort. 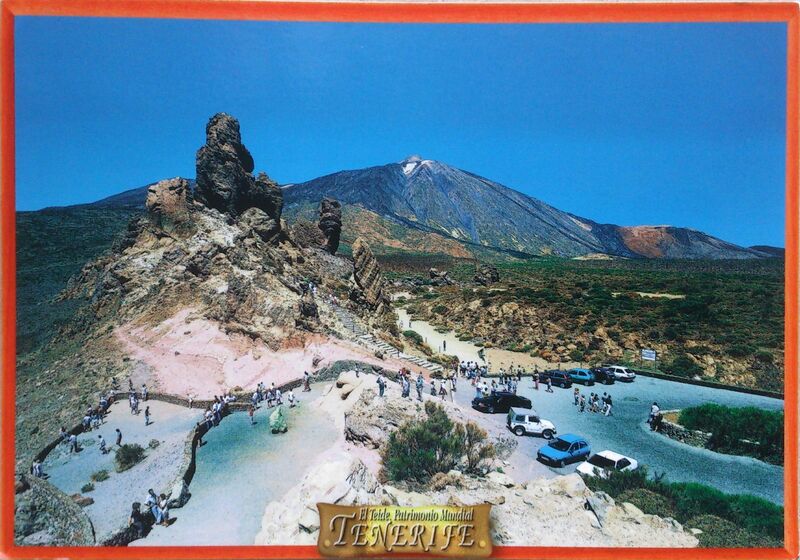 Teide National Park is a national park located in Tenerife (Canary Islands, Spain). It is centered around 3718 m Mount Teide, the highest mountain of Spain and the islands of the Atlantic (it is the third largest volcano in the world from its base on the ocean floor). It was declared a national park on 22 January 1954, making it one of the oldest national parks in Spain. It is also the largest national park in Spain and an important part of the Canary Islands. Another volcano located in the park (next to the Teide) is the Pico Viejo. It is the second largest volcano in the Canary Islands with its 3,135 m peak. The park has an area of 18,990 hectares and was named a World Heritage Site by UNESCO on June 29, 2007. Since the end of 2007, it has also been one of the 12 Treasures of Spain. 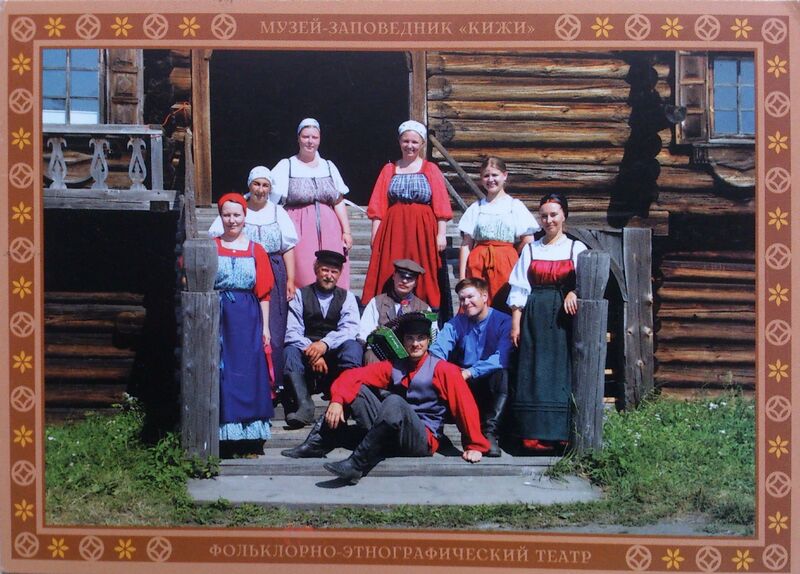 The Kizhi Open Air Museum is the world famous museum of wooden architecture, a particularly valuable object of cultural heritage of the peoples of the Russian Federation. The main exposition is located on the island of Kizhi in Onego Lake. The basis of the museum collection is the architectural ensemble of the Kizhi Pogost, a UNESCO World Cultural and Natural Heritage Site. General and thematic tours, demonstration of traditional crafts, the folklore and ethnography theatre performances, festivals on Kizhi Island, bell ringing and a souvenir shop are offered to visitors of the island. 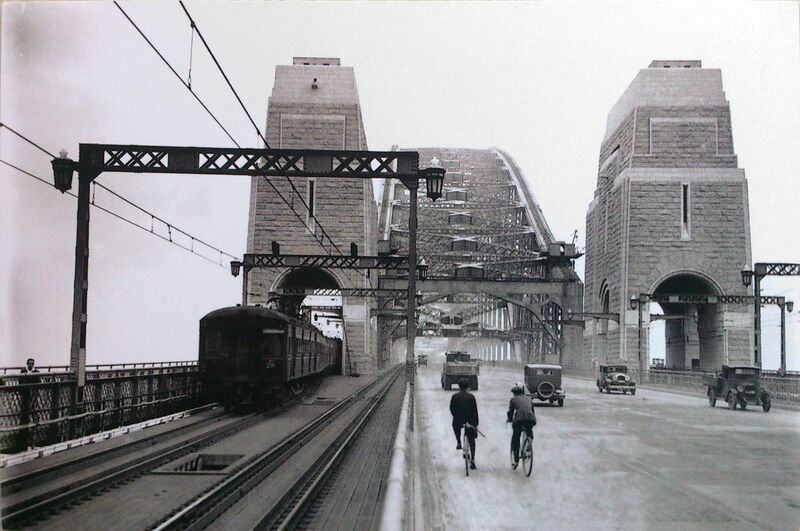 You could also take a look at my other postcard picturing Sydney Harbour Bridge. Highland cattle are a Scottish breed of cattle with long horns and long wavy coats which are coloured black, brindled, red, yellow or dun. Highland cattle are capable of surviving some of the harshest environmental conditions in some of the roughest hill country of northern Scotland. 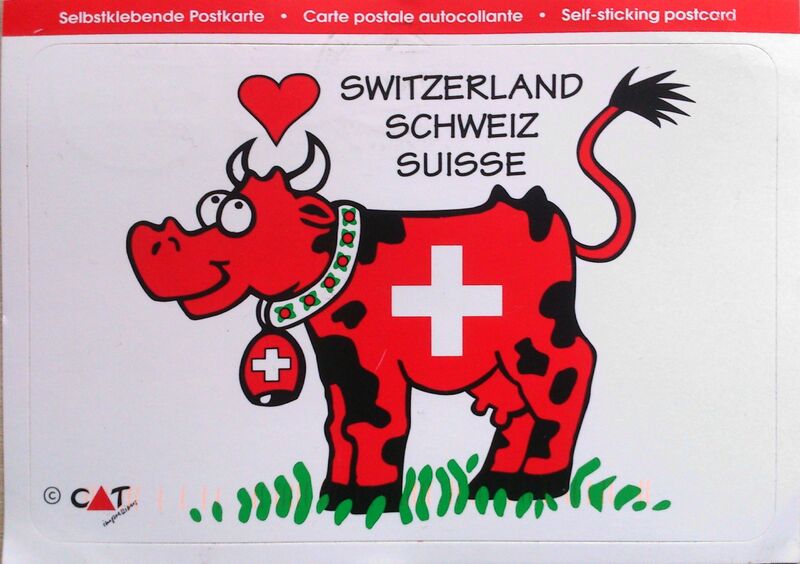 They were originally kept by small farmers and used to raise a calf and produce milk for the farm family. 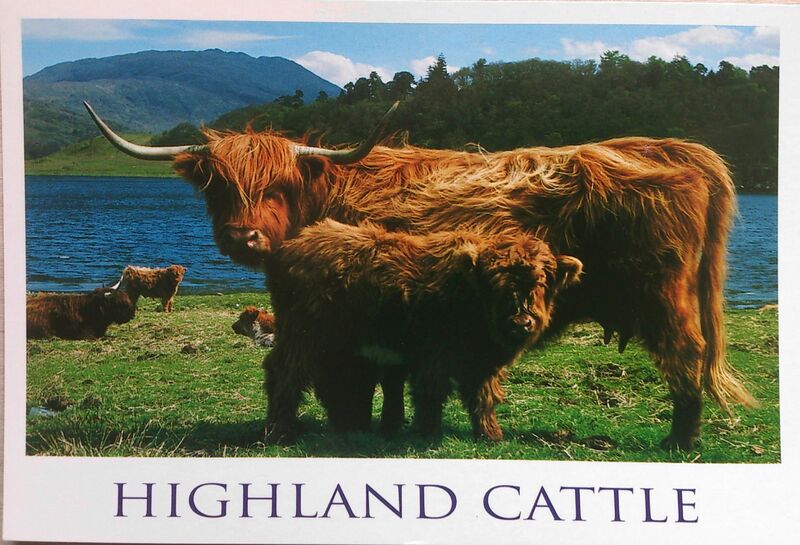 In Great Britain the Highland Cattle Society was formed over one hundred years ago to preserve this ancient breed. The Royal family are members, patrons of the society, and keep very good Highlands at Balmoral Castle in Scotland.